2000W 24V brushless DC motor with good quality and cheap price, 48V, 72V, 96V are available here, IP65 rating with shaft seal, complete protection from dust particles. It is widely use in automatic machinery, medical institutions, electronic equiment etc..
130 mm square flange size, making it easy to install. Self-controlled inverter is applied in brushless DC motors. 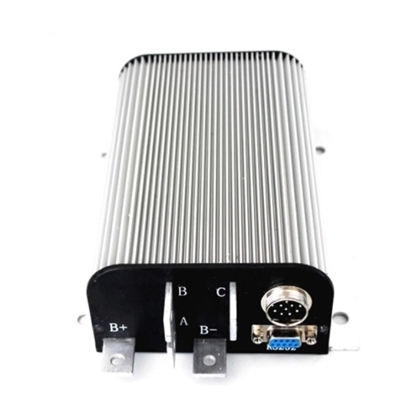 It is different from the normal inverter. Its output frequency is not independently adjusted, but controlled by a rotor position detector mounted on the shaft of a synchronous motor. Whenever the rotor is rotated through a certain position (for example, 90° or 120° electrical angle), the position detector generates a corresponding signal that acts on the corresponding semiconductor element to energize the corresponding phase winding to generate torque. Each time the motor rotor rotates a pair of magnetic poles, the respective semiconductor elements conduct one turn in turn, and the alternating current output by the inverter changes correspondingly by one cycle. Therefore, the output frequency of self-control inverter and the motor speed is always synchronized; there will be no out-of-step phenomenon. I finally bought this 2kW 24V BLDC motor and the controller ATO recommended, which have been perfect for my project. After purchasing 3 other motors, I finally bought this 2kW 24V BLDC motor and the controller ATO recommended, which have been perfect for my project. I needed something with high torque at lower RPMs, this motor did the job. I have two questions about the product and need you answer. Please give me your contact number or email soon.